I want to write in praise of SlowTV, the online video hub which is part of The Monthly's website. The name makes obvious reference to the slow movement that began with 'Slow Food' in Italy in the late 1980s. This started with protests against the opening of a McDonald's fast food restaurant in the historic centre of Rome. Led by activist Carlo Petrini, the slow food movement broadened to fight for the preservation of regional cuisines and associated traditional food plants, domestic animals and farming techniques. It now has chapters in many countries around the world, and has broadened beyond food to a general 'slow' movement, which seeks to promote a sense of connection within local cultures and communities in opposition to the alienation many experience in a globalised, homogenised, lowest-common-denominator world. 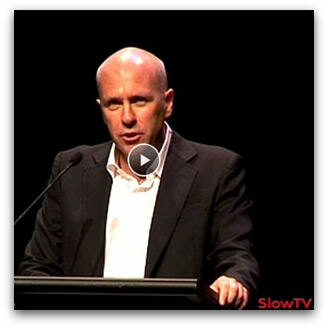 SlowTV expresses this philosophy through very plain no-frills coverage of important public events around Australia. On its homepage it says it is 'a free internet TV channel delivering interviews, debates, conversations and public lectures about Australia's key political, social and cultural issues'. Flanagan is not a writer isolated in his garret. He is engaged in his local community, and has become a prominent environmental activist, speaking out, for instance, against the proposed pulp mill in northern Tasmania. Near the beginning of this address, he makes an eloquent reference to William Tyndale's 1525 translation of the Bible, the first rendering of the holy book into English. This allowed ordinary people in England to read the sacred scriptures and interpret their own spirituality for the first time in their own language. In the same vein, Flanagan argues the copyright changes would diminish access to 'our own stories in our own voice', and a strong local literary culture allows us to 'discover ourselves in our own vernacular'. The Monthly's SlowTV portal is just one outlet for this pared down TV genre. Public broadcasters are also a natural home for this sort of television, an example being the ABC's Fora made in partnership with American web based Fora TV. Religious websites are also beginning to feature 'slow TV'. For instance, Sydney's Centre for Public Christianity offers an extensive range of excellent interviews and talks on its website. For those who value serious content over sensationalism and glitz, who want media meat rather than fairyfloss and cake, both the internet television channel, SlowTV, and the genre of slow TV are welcome parts of the new media explosion on the internet. And until this media provides captions/ subtitles for Deaf and hearing impaired people, it's all pie in the sky for us! don't quite know how I found it, but slowtv on my ipod is the best and most challenging programme, comes right after Late Night Live for me.